Geoff Martin's contribution to "On Air" brought memories flooding back (as they say). 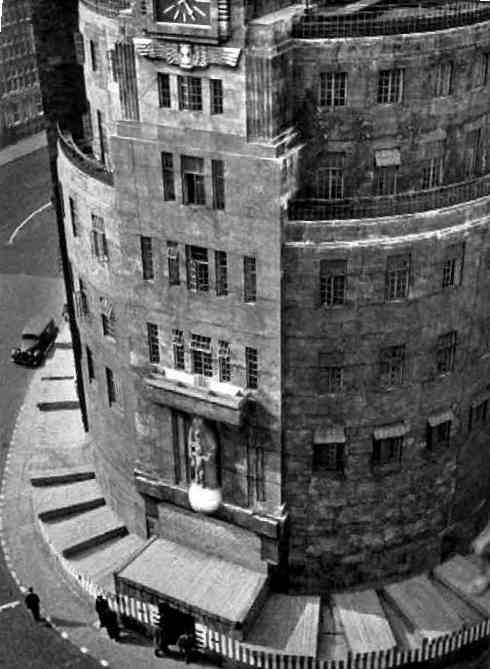 I joined the BBC some six weeks after Geoff (co-incidentally, I discovered only a couple of years ago that I was born just a month after him in the same maternity home!) So, after an interview in Bentink House, I too was accepted as a Yit on £1-7-6 plus 8/6 cost of living bonus and, like him, instructed to report to the Head of Lines Department (HLD) in Brock House, in my case on 22nd. May 1944 (15 days before D-day). In practice this meant making oneselve known to his secretary Mrs. Peters who, was quite quite the most formidable woman I met during my career in the BBC (and the BBC probably had more than its fair share of this species!). She issued me with a pass and told me to get over to Broadcasting House and report to Mr. C.E. (Charlie) Field in, I think, Room 131. So there I was, a sixteen-year-and one-month-old schoolboy from the sticks (i.e. Welling, Kent) walking into the entrance of the building housing the heart of the organisation responsible for wartime broadcasting to the UK and the World, behind an immaculately uniformed Col. David Niven. Wow!!! Charlie Field was in charge of what could be considered as the operational section of Lines Dept., responsible for the provision and maintenance of the links carrying programmes and control circuits between studios and transmitters (the SB. Network), links for outside broadcasts, and inter-office communication, both telephonic and telegraphic. He turned out to be quite a reasonable boss. I discovered that my duties would be split between manning the fault log (exactly as detailed by Geoff, who I now met for the first time) in the first-floor office, and maintaining a range of equipment in the Test Room, located in Room LG25, just below pavement level, and some telephone apparatus on the Control Room Balcony, which was located one floor down, on the level known as the Basement. The Control Room itself being on the Sub-Basement level, in what had been the art-decco Variety Studio. If memory serves, we normally worked until 6.30pm, or 10.00pm if scheduled for fault logging duty, but one could finish at six if one was attending an evening class at the Regent Street Poly. The evenings were of course lighter in those days since the country was operating on DBST. There was also a rota for Saturday afternoon and Sunday fault logging. An hour was allocated for lunch, but one could spend much of this in the long queue which stretched along the corridor leading to the Basement canteen. Much of the work carried-out in LG25 was connected with outside broadcasts. There were the portable equaliser repeaters mentioned by Geoff, PER2As and PER3s, with their associated crated HT and LT batteries. Geoff doesn't mention that among the duties we shared were the maintenance and charging of these glass-cased accumulators in a small room in the basement of Egton House. As well as maintaining the repeater sets one had sometimes to transport these heavy brass-bound teak objects to London rail termini by taxi and then, having found the correct train, "give them and their associated battery boxes into charge of the Guard", passing a suitable tip into his gnarled hand in order that he would remember to put them off at the required station. The other aspect of OBs was the testing and equalising of temporary circuits into BH. 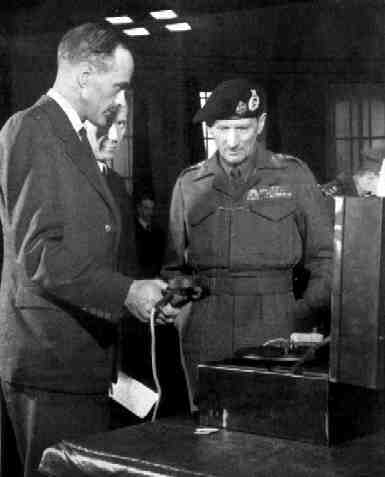 Either Ken Lake (an ex video camera-man from AP) or "Old Rootham" (who was well past retirement age) would set out to the broadcast site armed with a PTS10 (an early design of the young Neville Watson, then stationed in Birmingham/Manchester), and a field telephone. If/when he managed to establish contact one would carry-out DC tests with a Bridge Megger, and then "squeak" the circuit, using an Amp. Det., in order to be able to plot out its amplitude/frequency characteristic. Having done this one tried for a best fit with an equaliser mask, and from this determined the equaliser settings which would be required to be set for the broadcast. For most of the local London venues this seemed to be nothing more complex the a "fifty ohm shunt". Finally the noise was measured by means of a TPM, plus "earholing" on a loudspeaker. A bonus when working in LG25 was access to a line feed of the American Forces Network which was not then receivable in downtown Welling. This was something quite different as they say. 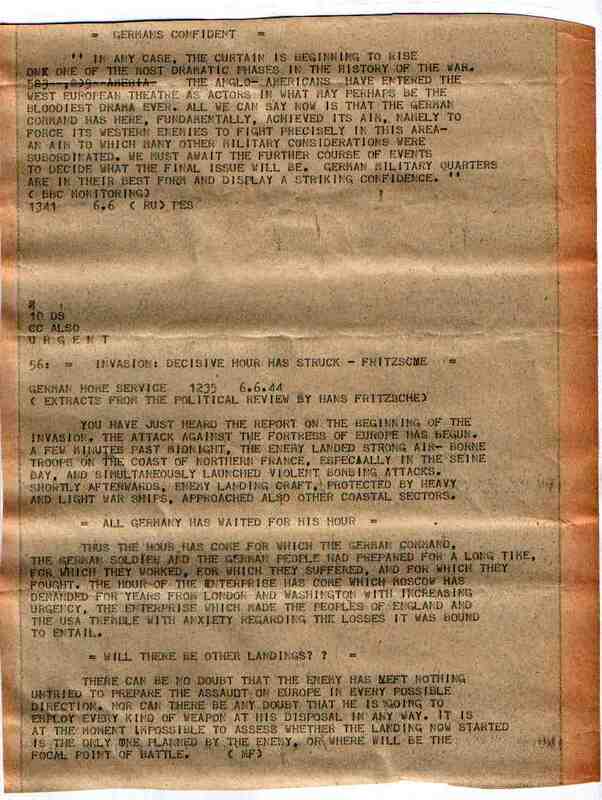 On D-day+1 the AEF Programme came into being. This was receivable, with difficulty, in downtown Welling and brightened things up considerably radio-wise. It also resulted in a sprinkling of Americans and Canadians lunching in the canteen. Among the latter bubbly CWAC Lt. Charmian Sansom comes to mind. Soon after D-day the V1s started to arrive. This was no problem if one was working in LG25 or below, but the first-floor office, being on an outside wall, was different. Red lights and buzzers were installed in all the vulnerable offices, and when a chap stationed on the roof spotted a flying bomb coming BH-wards the alarm would be sounded. We would then move across the passage into a small test room located within the tower to await the extinguishing of the red light. This refuge was shared with the occupants of the War Reporting Office which was located next door, among whom on a couple of occasions we had the company of Richard Dimbleby. The V1s did not do much for the ease of commuting. Southern Railway trains would be diverted around circuitous roots to by-pass damage, and the Bakerloo Line would be shut down whenever the threat was considered serious enough to shut the watertight doors on the under-Thames section. In the June and July evenings people sleeping in the tube stations left barely enough room on the platforms for passengers to wait. On 31st. July I was promoted to Probationary Technical Assistant on £2-5-0 plus cost of living bonus. On 21st. August I was sent on a four-week basic theory course at the Hamilton Shasky academy located in Maida Vale Studios. I suppose there were around thirty students in attendance. The seating plan placed me between Charles Gunn-Russel and a Jill Corvine-Richie, both just down from Oxbridge, whereas I was just up from Woolwich Poly! We were however all starting from square one in the subjects covered, and got on with each other quite well, and all scraped through the final exam. I remember the liberation of Paris being announced during one of the early sessions. I got back to BH on 18th September, (by which time the V2s were beginning to take over from the V1s), and nine days later I was sent off again to Cambridge, (where they hardly new what a bomb was!) together with an old school friend Nobby Clarke, and Johny Dewis, who I think had been invalided out of the forces and was something of an intelectual. This was as near as I ever got to a university, but we were headed for the Post Office Training School for a four-week course on the Creed 7B Teleprinter. The 7B was quite a an electro-mechanical box of tricks, but we were told that by the end of the course we would be able take a jumbled set of basic components, assemble them into a printer, adjust it and set it to work, without access to the handbook. And the surprising thing was that when the time came, we found we could! An ability which was to come in handy in the REME some three years later. The other members of the course were PO trainees and a group of RAF personnel. The school operated the PO system whereby one signed-in on arrival in the morning, and at the start time a line was drawn across the page to separate the sheep from the late coming goats. This was not a problem for me because, for the only time in my BBC career, I was living only a short walk (across Parker's Piece) from my work. There was not a lot to do in wartime Cambridge, a problem which also faced the truckloads on GIs who swarmed into town in the evenings and disappeared into the American Red Cross "Doughnut Dugouts". I returned to the real world just in time to bid farewell to Ted Howland who was off down the mines as a Bevin Boy. He had been largely responsible for the telegraphy side of the business and I found myself moved in as his replacement. 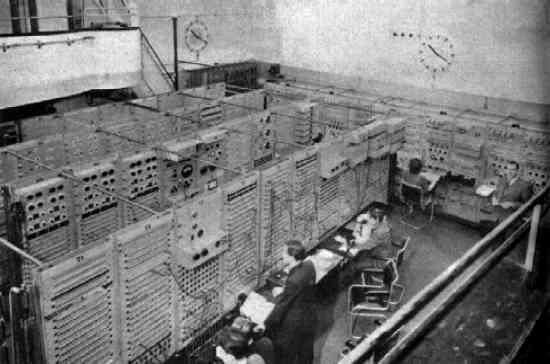 The main part of the job involved maintenance and overhaul of the BH inter-regional teleprinters, and operational maintenance of the Caversham Broadcast system located in B27, a room to which I got more or less exclusive use as a perk of the job. 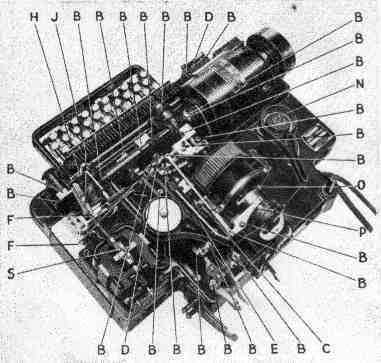 The Broadcast system was a quite advanced electro-mechanical set-up for disseminating Monitoring Service output to teleprinters around the London area. There were two lines incoming from Caversham, the material on which could be routed to any number of the twenty or so participating out-stations to which it was considered relevant. The operators at Caversham could select the outstations they wanted, and the equipment in B27 would route the signals accordingly. The snag was that the Caversham operator had no means of knowing whether the information had actually been printed at the destination. So at least once a day somebody in B27 had to test for an answer-back from each of the outstation printers and, if any failed, try to sort out why and get it fixed. The BH telprinters were at that time located in Room 240. There were around nine permanently connected positions plus a Telex. This latter was I suppose a precursor of the E-mail. The operator just dialled a number, checked the answer-back and then sent the message. If a satisfactory answer-back was obtained at the end she could be pretty certain that it was there at the destination in hard copy, which is more than one can say for the present system! The operators in 240 were a wider social mix than one would expect to find today. This was probably a result of the direction-of-labour statutes then in place. They were watched over by another dragon lady, the Supervisor, Miss Carter, who kept a beady eye on them and on any PTA who was trying to sort out problems in her area. The most dreaded problem was a report of a "sticky keyboard". This was not easy to solve, although one could always squirt a little oil in one or two places. Sometimes it was probably just that the operator was a bit bored and wanted a break and/or someone different to talk to! 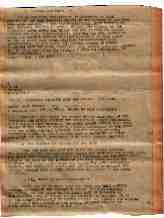 To provide a bit of variety one afternoon a week was devoted to a trek out to the Arabs at Aldenham to maintain their printer, and once a fortnight there was a GWR awayday, via Oxford, to Salaries located in the wilds at Wood Eaton, for a like purpose. Salaries appeared to be largely staffed by teenagers bussed in each day from their hostel several miles away. 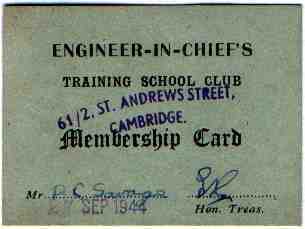 Incidentally I don't think it is generally appreciated how much teenage boys, and girls, contributed to keeping the BBC on air during the war years, and this was particularly true of the Engineering Division. In November I was promoted to TA2, something definite at last! About this time an NBC war correspondent (Ed Haaker or sometimes Bjorn Bjornson) took to dropping in to B27 mid-morning to check for the latest news on the Agency printers operating therein and to pass the time of day. He would then cross the passage to a small talks studio where he would do a live insert into what I suppose was a US East Coast breakfast news programme. The job proceeded fairly uneventfully for the next few months. One event which does come to mind however occurred probably in the March of '45. A head poked around the door of LG25 and said "come and see the man who is winning the war for us". So we went out into the passage and waited for a couple of minutes outside a neighbouring talks studio door until a Battle-dressed figure, wearing a beret with two badges, emerged. We clapped politely and Monty, who had been making a recording, smiled and bid us "good morning" which was nice! May brought VE-day. I was volunteered to come in, but not a lot of work was done. In the early evening Regent Street was effectively pedestrianised by the crowds and Piccaddily Circus was packed solid, with a Liberator bomber flying overhead firing off coloured flares. As I made my way home I could have reflected, but I am sure I did not, that it had been a fairly eventful, but on the whole successful, first year.